Tx3-194 near Sucha in 1976. Photo Werner and Hansjorg Brutzer. It has been three months since the last instalment of our imaginary journey on the 600mm gauge Kujawy narrow gauge railways in 1939. We left our intrepid narrow gauge traveller at the northern extent of the Wrzesnia District Railway. The journey so far. Extract from the WIG map of 1935 showing our 1939 narrow gauge route marked in green. Onward from Kleparz we run alongside the road for a while, but then veer away to the left and pass Grzybowo Wlkp., a loading loop with a siding heading back to the left to serve the estate farm. Only a few hundred metres beyond that, beside the crossing of a side road, is the halt and loading loop of Grzybowo Rabiezyce, then we head back towards the road, cross it and turn again to run alongside it, passing Grzybowo Chrzanowice halt and loading loop. These loading loops may be busy in the sugar beet season, when farmers bring sugar beet to be taken away by railway or collect the pulp to take back to their farms, but at this time of year they are deserted, while it is difficult to imagine the halts ever having seen much traffic during the brief periods when passenger services ran. We follow the various turns in the road past the halt at Wodki, with its loading loop and siding on the right to the estate farm, only a kilometre beyond the last of the Grzybowo halts. After a further series of curves alongside the road we cross it again (the road is now on our right) and then comes a long straight beside the road to Mierzewo, 15km from Wrzesnia. Mierzewo is by no means a large station but, after the succession of almost abandoned loading loops, it does give the impression of having arrived somewhere. As we enter the station, the junction with the Stanislawowo branch is formed by a triangle of tracks to the right, at which the main line curves slightly to the left, away from the road, to enter the run-round loop, beyond which is a level crossing and a siding on the right to a farm. This siding turns out to be the destination for two of the empty wagons we have brought from Wrzesnia; some shunting is required before the loco can propel the two wagons into the siding and then it takes water before coupling up to the remaining wagons ready to propel them down the 4km branch to Stanislawowo. The brake van is detached and left at Mierzewo, while the guard climbs onto the end platform of one of the wagons to provide any braking assistance that may be needed. 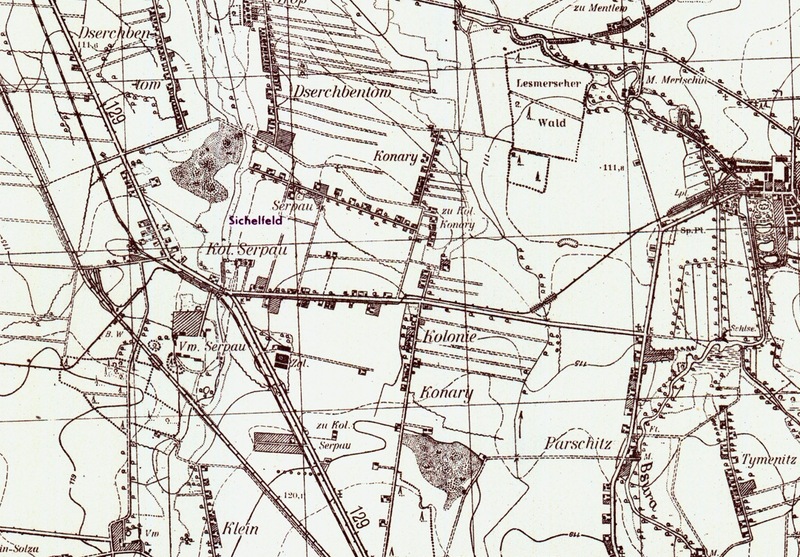 Mierzewo, Stanislawowo and field railways towards Mielzyn. Extract from the WIG map of 1935. North of Mierzewo, the Gniezno district railway’s line to Arcugowo once had a passenger service, but this seems to have ceased during or shortly after the Great War, and the line now sees only freight traffic. We could walk the 7km to Arcugowo, but prefer to head for Mielzyn, terminus of another branch of the Gniezno system and, as Stanislawowo is closer to Mielzyn than Mierzewo, we continue with our friendly crew(17). Initially, the branch seems to be dead straight and, after passing a junction with a short field railway to the left and throwing off a branch to the right, ends at a buffer stop beside a cart track at a location apparently called Krolewiec. It turns out that the branch we passed is in fact the ‘main line’ to Stanislawowo and the end of the straight is a siding, destination for another two of the empty wagons. With these uncoupled, we retrace our steps to the turnout and set off across the fields, passing another short field railway branching off to our left. The true terminus of the branch is a large farm, at which an estate railway also terminates (we crossed one line of this field railway as we entered Stanislawowo), and for which the remaining empty wagons and the loaded coal wagons are destined. Here we bid farewell to the Wrzesnia crew and their railway and set off on foot for Mielzyn. The journey of some 19km has taken almost three hours, including the shunting at Mierzewo and Krolewiec. We walk along the road, heading north east past Krolewiec; we could have saved ourselves a bit of a walk by disembarking at that location, but we have plenty of time to get to Mielzyn. Turning right through the village of Jaworowo we soon encounter a field railway on our right, and then another crosses the road along which we are walking. On the far side of the village we see that this second field railway actually joins the Mielzyn branch at Jaworowo halt, where there is also a loading loop and a siding. We could catch the train from here but, as we still have a couple of hours before the train leaves Mielzyn, we continue our walk to the terminus. Along the road we pass the occasional horse and cart, and one or two people on foot. In the surrounding fields we see the typical scenes of the Polish countryside – gently undulating fields that stretch away into the distance, a few watercourses, in places a group of people loading a horse-drawn cart, in other fields people are working the land by hand. There is little sign of mechanisation other than the railway. 17) Mierzewo – Stanislawowo appears to have been a branch of the sugar factory’s 900mm gauge railway, but opened to public traffic on 600mm gauge in 1895; it was regauged to 750mm in 1957. Krolewiec – Stanislawowo closed in 1968 and Mierzewo – Krolewiec in 1973. Wrzesnia and the freight-only narrow gauge railway north-east towards Kleparz. Extract from the WIG map of 1935. After a long day and an evening talking politics over a few glasses with the locals in our Wrzesnia hotel, we have slept well. We wake refreshed and have a hearty breakfast, for we have another heavy day ahead. The Wrzesnia district railway, on which we reached the town the previous evening, is linked to the Gniezno district railway and, through it, with the main PKP Kujawy system. The link line to the Gniezno railway once had a passenger service, but this last ran in 1928. Fortunately, however, our discussion with the locomotive crew during our long wait at Pyzdry yesterday revealed that they were rostered for a freight train north from Wrzesnia today, and they have invited us to join them. So, after breakfast we pay our bill and walk back to the yard. While the regular passenger service to Pyzdry warrants use of the railway’s most modern motive power, freight services on the line north are not required to adhere to a strict timetable and so the older locomotives are used. Consequently, we can see at the depot loco No. 3 raising steam, a Krauss 0-6-2T dating from 1897(13). A cheery wave from the crew hastens us across to join them. Before we can depart, however, there is much shunting to be done, so we take the opportunity to have a look at the loco depot, where we see No. 2 standing cold inside the shed(14) and No. 4 outside undergoing boiler washout(15). An hour or more passes as wagons are moved from one siding to another and finally we are ready to depart with a train consisting of a couple of bogie wagons full of coal and half a dozen empties, plus the inevitable brake van. Leaving the yard we pass the station and head north and north east(16). On the outskirts of town a siding runs back to the right, serving a dairy, and soon afterwards we cross on the level the standard gauge Wrzesnia – Strzalkowo line which, when the narrow gauge was built, was just a branch to a village near the border with Russia. Since the early ’20s, however, it has become part of the main line between Poznan and Warszawa; this may be one of the reasons why passenger trains no longer run on the northern part of the Wrzesnia system. We cross the standard gauge with the main Wrzesnia – Gniezno highway on our right, and continue alongside the road (seeing a motor car as well as a bus) for a while before crossing it to set out into the countryside. We cross a watercourse and a couple of trackways to reach the halt at Sokolowo, with its loading loop, beside a large farm at a junction of trackways. Continuing alongside a trackway (and beyond that a drainage channel), we pass the loading loop at Ostrowo Poludnie, the classic ‘halt in the middle of nowhere’. We soon curve left across another ditch, still alongside the trackway and then head right, leaving the trackway, across another roadway and enter Ostrowo Wask., another loading loop beside a large farm and junction of trackways, but this time a siding leads off from the loop to the farm on the left. Here there is a brief pause while the fireman rakes the fire and adds some more coal, then we continue eastward, across a couple of ditches, and curve slightly right before passing the loading loop at Ostrowo Wschod. Kleparz, where the Wrzesnia and Gniezno narrow gauge systems officially joined. All three branch lines had closed by 1939. Extract from the WIG map of 1935. After another kilometre we turn sharply left to run alongside a road, noting as we do so a turnout to the right that was the start of a siding back alongside the road to Gutowo Male; this siding has obviously been lifted relatively recently. And so we arrive at Kleparz, 8km from Wrzesnia, the original ‘terminus’ of the Wrzesnia district railway, but on the same day that the line opened to here, the Gniezno district railway extended its Mierzewo branch to form an end-on junction with the Wrzesnia line. The Kleparz – Mierzewo section seems to have been worked by the Wrzesnia railway from the outset, though quite when this was formalised by way of a lease is not entirely clear. What is clear, however, is that the heyday of Kleparz as a railway centre is now over, for although the loading loop survives (with a couple of empty wagons in it), along with the halt’s short ‘platform’, beyond it we pass remnants of two more recently dismantled lines: one runs back on the right, now only to the far side of the road crossing, while the other consists only of a diamond crossing with the main line and again the level crossing with the road. The first line used to run east and south some 3km to Gutowo Wielkie, crossing the standard gauge Poznan – Wrzesnia line and having a short branch to Gutowo standard gauge station, while the second ran north west for about a kilometre. 13) Wrzesnia no. 3 was Krauss works no. 3594. It was renumbered 5 in 1939 (I have assumed after the German occupation), and taken into PKP stock in 1949, becoming Pxb2-852. It went to Bialosliwie in 1957, became Pyb3-852 in 1961 and was withdrawn in 1963. 14) Wrzesnia no. 2 was another Krauss 0-6-2T, works no. 3593 of 1897. It was renumbered 1 in 1939, and became PKP’s Pxb2-851 in 1949. It went to Bialosliwie in 1957, became Pyb3-851 in 1961 and was withdrawn in 1966. 15) Wrzesnia no. 4 was a Krauss 0-6-0T, works no. 5156 of 1904. It was renumbered 2 in 1939 and became PKP’s Ty1-155 in 1949. It was sold to industry in 1955. 16) The Wrzesnia – Kleparz and Kleparz – Mierzewo sections opened in 1898 and were converted to 750mm gauge in 1957. Wrzesnia – Sokolowo closed in 1972, severing the remaining part of the Wrzesnia line from the main Kujawy system. Sokolowo – Mierzewo closed in 1979. Kleparz – Mierzewo reopened for the 1980 sugar campaign, but closed again the following year. Zieliniec, the major junction on the system. Extract from the WIG map of 1935. After a couple of kilometres with the main road still on our right comes Zieliniec, clearly a major location in railway terms. We pass through the first loading loop alongside the road, then swing left, away from the road, and a branch comes in from the right – this runs some 4km to loading points and a farm at Bieganowo(10). Then comes the station itself, alongside a road and with the passing loop straddling a trackway that leads off to the south. Here we wait for about 3 minutes, while the guard uses the telephone to get clearance for the section ahead. From the west end of the loop another branch heads back to the left, running 8km to Krzywa Gora. Curiously, this line initially runs south, parallel to the main line, before heading off west to serve various farms and loading points, with a couple of short subsidiary branches. With permission obtained to enter the next section we start away again and curve right, across the minor road, and encounter the third part of the Zieliniec ‘complex’ as a siding to the left is followed by another loading loop, from which yet another siding branches back right to the estate farm. Now we head out across open country, the main Wrzesnia road now some way off to our right and gradually diverging from the railway. Neryngowo station in 1970. Photo Andrzej Smigielski. Soon we pass the halt at Janowo, with a loading loop into which runs a field railway from the east, and shortly afterwards we cross a road and pause briefly at Neryngowo, which again has a loading loop and a short branch running in from the right, which was only built in the last year or so(11). Setting off again, we soon lose the trackway that serves the loading point, and as we run across the fields we pass over a small river before reaching Nadarzyce, with another loading loop and a short branch heading off to the north east(12). We curve slightly to the left, following the slight valley of the Wrzesnica river, and cross another small river before reaching Kaczanowo halt – another loading loop but no branch this time. Leaving Kaczanowo we cross a road and curve right to run alongside it, following the right and left hand curves of the road, crossing a few trackways and another watercourse as the buildings of Wrzesnia come into sight. A curve to the left brings us to Wrzesnia Miasto halt, its loading loop sandwiched in the fork between two roads. The location is obviously considered more convenient for the town than the standard gauge station, for it boasts a quite sizeable and very modern station building; a number of passengers alight here. Leaving the halt we cross a fairly major road and after a few hundred metres turn sharply right across a more minor road and then there opens out a fan of narrow gauge tracks. On the left we pass the railway’s offices and a transhipment facility with the standard gauge tracks, while on the right a multitude of parked up wagons and vans partly obscures our view until, at the north end of the yard, we pass the workshops and four-track loco depot, accessed via a turntable in roundhouse style. Our train, moving fairly slowly now, crosses a standard gauge siding serving the sugar factory on our right, while to the left is a range of standard gauge sidings forming part of the main station yard. We trundle over a couple of turnouts that give access to the narrow gauge sidings serving the factory, pass a run-round loop and weighbridge, cross a road and then grind to a halt at Wrzesnia station, consisting of another run-round loop, another weighbridge, a siding heading back to the sugar factory and a small ticket office. The 24km from Pyzdry to Wrzesnia have been covered in 1 hour and 17 minutes, an average speed of just under 19kph (around 12 mph). A few passengers from our train walk across to the standard gauge station and, as the locomotive heads off for the shed, we gather our bags and walk to our inn for the night, fortunately not far from the station, for it is already after 20:30 and the day’s exploration has left us weary and ready for a quick meal, some beer and bed. 10) The Bieganowo and Krzywa Gora branches opened about 1911, were regauged to 750mm in 1957 and closed in 1966. 11) The Neryngowo – Gozdowo branch opened about 1938, but was closed in 1946. 12) The Nadarzyce branch opened in 1898, was cut back to a few hundred metres after 1945 and probably closed in 1957 when the rest of the railway was re-gauged. After a hot two hour walk we have enjoyed a couple of glasses of the local brew at Pyzdry, the southern terminus of the Wrzesnia District Railway… . Pyzdry, the southern terminus of the Wrzesnia District Railway. Extract from the WIG map of 1935. Pyzdry station is another relatively simple terminus, the railway having extended this far as recently as 1930. The track layout consists of the platform line, run-round loop and dead-end loading siding. The small lavatory is situated at a suitable distance from the main station building which, rather curiously, combines the waiting room, dispatcher’s office, locomotive shed and seemingly train crew lodging in a single block; access to the loco shed is via a turntable which is located, instead of the usual turnout, at the convergence of the platform line and run-round loop. Compared to the Jarocin district railway, the Wrzesnia line’s timetable is extensive, with a daily service of three trains each way. A locomotive is stabled at Pyzdry overnight, with the first departure of the day being at 05.18 and the last arrival at 23.17. We reach the station in time to see a passenger train arrive shortly after 4pm, but we have a long wait until the next departure at 19.21. The locomotive today is the almost new No. 5, built the previous year by the factory at Chrzanow(7). The crew see our interest in their steed and proudly show us all the ‘mod cons’ such as the superheated boiler which allows the 0-8-0 tender locomotive to develop no less than 110hp. The train of two bogies coaches and a van, however, are much older, dating from the opening of the line in 1898. Wagons in the loading siding at Borzykowo II in 1970. Photo Andrzej Smigielski. During the layover, the crew take the opportunity to clean the fire, pull forward coal and fill up the tender water tank using the pump located beside the turntable and eventually the time comes for our train to depart. Soon we are off across the road and then swinging left to run alongside it(8). On our way north west to Borzykowo we cross again the former border between Germany and Russia and, after 4km, comes our first stop at Borzykowo II station, once the frontier post, where a line trails in from the left. This was once the terminus of the line and the track leads to a run-round loop and loading siding. About a kilometre further comes Borzykowo I station, again once a terminus, but now just a loading loop. By this time of day there are few passengers and most station stops are brief. Zydowo and the Gorazdowo branch. Extract from the WIG map of 1935. Another couple of kilometres of running alongside the main road brings us to Kolaczkowo, a loop and a long siding off to the left leading to a farm complex, at which our train crosses the main road to Wrzesnia and then turns sharply to the right to run alongside it. Then comes Zydowo, where we cross the road and a branch heads back to the right for 2km to a loading point and distillery at Gorazdowo(9). The halt has three tracks: the main line, a loading loop and the branch to Gorazdowo sandwiched between them and crossing the access track to the loading siding by means of a diamond crossing. On leaving Zydowo we cross back over the main road and shortly reach Sokolniki, with its loading loop and waiting shelter. 7) Wrzesnia no. 5 was Chrzanow works no. 727. It was renumbered 4 in 1939 (I have assumed after the German occupation) and taken into PKP stock in 1949, becoming Px2-805. It went to Bialosliwie in 1957 and to Myszyniec in 1958, initially became Px4-805 in 1961 and then Px38-805. It went back to Bialosliwie in 1972 or 1973 and later to Znin. The superheating was later removed and it became PKP’s last operational 600mm gauge steam locomotive. It is still at Znin and believed to be still operational. 8) The Wrzesnia railway opened the Wrzesnia – Borzykowo I line in 1898. In 1905 the line was extended to Borzykowo II; this section may have closed in 1920 but then re-opened and was extended to Pyzdry in 1930. The railway was regauged to 750mm in 1957 and closed in 1976. 9) The Gorazdowo branch opened in 1898, was regauged to 750mm in 1957 and closed in 1966. Tx3-194 near Sucha in 1977. Photo Werner and Hansjorg Brutzer. The 08.25 from Witaszyce is shown in the timetable as train no. 1 and has taken 52 minutes to cover the 16km to Sucha, an average speed of just over 18kph (less than 12mph). Now it morphs into train no. 2B and after a few minutes sets off up the branch line to Robakow. The Robakow and Lubinia Wielka branches. Extract from the WIG map of 1935. The 4km branch has one intermediate stop at Grab, with a single siding, and the terminus, reached after a 14 minute run from Sucha, features just a run-round loop and loading siding. Whilst Grab was a modest hamlet, the terminus of the branch seems to be a road junction in the middle of nowhere. Just down the road, across a branch of the Prosna river, can be seen the settlement of Robakow, about half a dozen cottages and a large farm. A solitary passenger leaves the train and heads off down the road, while nobody joins the train – why would they? Anybody wishing to travel to Witaszyce would have to wait at Sucha for nearly four hours until the train returns from Komorze, while anybody wanting to travel to Komorze, or stations en route, would probably walk the 3km or so to the station at Lubinia Wielka to catch the train. The locomotive runs round and after ten minutes we are heading back to Sucha as train 2A. Upon arrival at Sucha (another 14 minute, 4km run) the locomotive swiftly runs round the train again, resumes its identity as train No. 1 and sets off once more along the main line for Komorze. The next stop is Lubinia Wielka, where a freight line branches off to the left; it runs a couple of kilometres to end in the fields. Then comes Miniszew, a simple halt, followed by the halt and loop at Kretkow. The scenery along the way is once again open fields with the occasional block of woodland; a few passengers board or leave the train at these halts. Przybyslaw and the freight branch towards Lgow. Extract from the WIG map of 1935. Then comes Przybyslaw, where a long loop forms the base of a triangular junction for the 8km freight branch to Lgow, off which a number of subsidiary branches run to various loading points, farms and at least one distillery(6). At Przybyslaw itself a long siding leads from the loop to serve a dairy and distillery. Unlike Twardow, there is no sign of another train serving this branch, but perhaps during the two-hour layover at Komorze our locomotive will run down the branch to pick up a few wagons. For the time being, however, we pause here only briefly as a few passengers alight, and then amble the final two kilometres to Komorze, another simple terminus with run-round loop and loading siding. Because of the diversion to Robakow, the 29km journey from Witaszyce has taken 2 hours and 23 minutes, an average speed of some 12kph (8mph); it is not surprising the train only runs twice a week. Two narrow gauge railway termini: Komorze and Pyzdry. Extract from the WIG map of 1935. Beside the station at Komorze is the building of the long-defunct sugar factory – rendered redundant when the railway opened and beet could be transported to the much larger facility at Witaszyce – and beyond that another distillery. A separate field railway heads off north for a couple of kilometres alongside a cart track, to a nearby farm. As the few passengers who have travelled this far wander off in various directions, we pick up our bags and set off on foot. Our destination is Pyzdry, terminus of the Wrzesnia district railway, but to reach the town we must cross the river Warta, and river crossings are few and far between. Initially we head in a generally easterly direction, crossing the Prosna to Ruda Komorska. Traffic on this country road is light, consisting of a few horse-drawn carts and pedestrians; we see no motor vehicles. In crossing the Prosna, we cross what was, until 25 years ago, the border between Germany and Russia. From Ruda Komorska we head north east, again along cart tracks, along the edge of the uncultivated Warta flood plain, to the main Kalisz-Pyzdry road and then, heading north west, reach the bridge over the river, crossing which brings us to Pyzdry itself. On this more major route we are passed by one light motor lorry and a motor charabanc, but otherwise the road traffic is much as it has been for the last century or so. The walk has been pleasant enough but the hot sun and dusty roads have left our throats rather dry. Fortunately, however, we have plenty of time to slake our thirst on the local brew and partake of a late lunch in one of the town’s hostelries before walking up to the station on the north side of town. 6) The Lgow branch opened in sections between 1909 and 1911. It closed in 1979. Witaszyce, Jarocin District Railway. Extract from the WIG map of 1934. What was it like to travel on the narrow gauge railways of Poland in the 1930s? In an attempt to find out, let us take an imaginary journey over the Kujawy network in that uneasy summer of 1939. It is highly unlikely that anybody would have made such a journey – most passengers on these lines were using the train for relatively short, local journeys – but it is just possible that early railway enthusiasts may have made, at least, parts of this trip. Whilst it will be necessary to travel both ways on a number of lines, the nature of the network allows us to make single directional trips over several routes. However, our narrow gauge travels begin one Monday morning on a line that was not actually part of the linked network – the 600mm gauge Jarocinska Kolej Powiatowa (Jarocin District Railway). The line sees only one train each way (and even that only runs on Mondays and Fridays), with the morning departure from Witaszyce being at 08:25, allowing connections from a Poznan – Warszawa (via Ostrow Wlkp.) train at 08.00 and an Ostrow – Poznan service at 08.20. The little station of Witsazyce Wask. is quite busy as various local inhabitants avail themselves of this infrequent opportunity to make their journey. Many of them arrive at the station on foot and a few travellers walk across from the standard gauge station as the two connecting services depart. Beyond the standard gauge line the sugar factory is quiet at this time of year, but in a few months the sugar campaign will start and the factory and railway will become hives of activity. At the brickworks to the north of the narrow gauge station there is some activity, but business is still not what it was before the depression. Witaszyce station in 1976. Photo Helmut Philipp. Shuffling around the yard we can see the locomotive for our train, 0-8-0T No. 2, one of three such locomotives built by Hagans in 1901 for the opening of the line(1), while in front of the workshop 0-8-0T No. 4, a Borsig product of 1907, is receiving some attention(2). Standing at the platform are two coaches and a van, all bogie vehicles. Examination of the builder’s plates shows that one coach and the van were produced by Freudenstein for the opening of the line in 1902, while the other coach came from Goerlitz in 1918. We board the train and soon the loco couples up and without great ceremony our journey begins, across the road beside the station and soon curving north away from the standard gauge(3). As we pass the village itself, we rumble across the flat crossing with the brickworks’ railway and shortly afterwards a bridge takes us over the main road between Jarocin and Pleszew. Then a siding branches off to the right, to some sort of quarry or similar industry. The train ambles through fields, crossing a few tracks and minor roads, then crosses the biggest structure on the line, the brick arch bridge over the river Lutynia, before curving round the village of Wola Ksiazeca and pulling into the station. Twardow and the goods line towards Czermin, Jarocin District Railway. Extract from the WIG map of 1934. As a few passengers leave and board the train, we notice a siding leading off right to some agricultural buildings in the village. Soon we are off again, running alongside a road to the next station at Twardow. A brief pause and we set off once more across fields and after a kilometre or so there is a loop where the goods line to Czermin branches off(4). Here we see locomotive No. 5, a Borsig 0-6-2T dating from 1913, waiting for us to pass before setting of to Witaszyce with a short rake of wagons that have presumably come off the branch(5). After our next stop at Racendow the fields give way to forest for a while, but the trees then peter out and we pause at Lubinia Mala. Then we cross the road through the village and turn ninety degrees to the right, pass the village and after another couple of kilometres we reach Sucha, the main junction station of the system. Lublinia Mala and the junction station of Sucha, Jarocin District Railway. Extract from the WIG maps of 1934 and 1935. 1) Jarocin no. 2 was Hagans works no. 456. Its sisters were 455 and 457. They were built as 0-8-0Ts with the rear axle having a sliding arrangement to allow them to go round tight radius curves. This proved troublesome and was later removed (I have assumed in PKP days, but cannot find a date) to make them 0-6-2Ts with the trailing axle being the same diameter as the driven axles. They were taken into PKP stock in 1949 and numbered Txb1-264 to 266 and in 1961 the series designation became Tyb3 or Tyb1, but the running numbers (264 to 266) remained the same. They were all withdrawn in 1965. 2) Jarocin no. 4 was Borsig works no. 6281. It was taken into PKP stock in 1949 and became Tx3-429. In 1961 it became Tx4-563 and was withdrawn in 1967. 3) The Witaszyce – Komorze and Sucha – Robakow lines of the Jarocin railway opened in 1902. 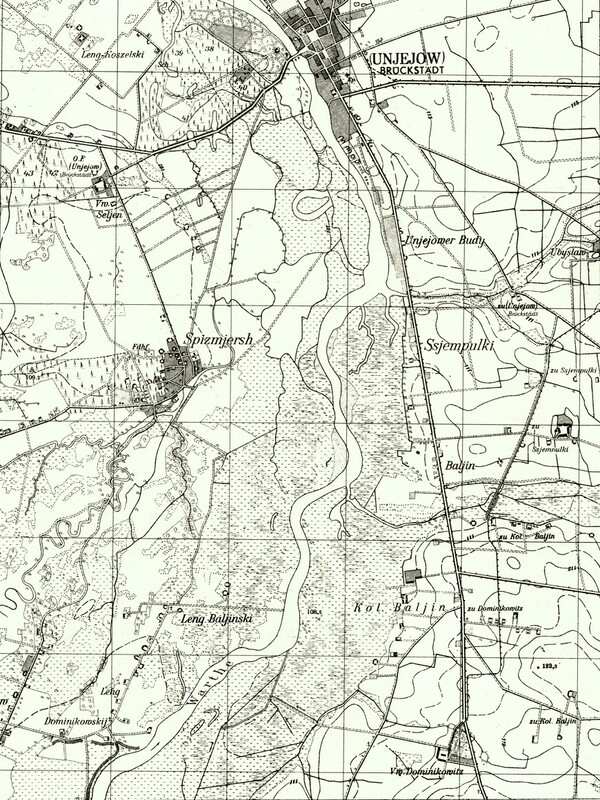 In 1943 the Robakow branch was extended by 24km to reach Trabczyn. In 1947 a further 6km section of line opened from Grabina (6km short of Trabczyn) to Zagorow and in 1949 the railway was taken over by PKP. Grabina – Trabczyn closed in 1979, Sucha – Komorze in 1987 and Witaszyce – Zagorow in 1991. All lines have been lifted. 4) The Czermin branch opened in 1915 and closed in 1979. 5) Jarocin no. 5 was Borsig works no. 8741. It was taken into PKP stock in 1949 and became Txb4-471 (or possibly Tyb4-471). It went to Mlawa in 1950 and was fitted with a tender, became Tyb5-471 in 1961 then went to Myszyniec in 1962 and to Bialosliwie in 1973. It was withdrawn in 1974 and is now in the museum at Wenecja on the Znin line. The last missing piece restored. Photo FPKW. (Click to see the full track repairs photo gallery). Over the June long weekend, 30 May to 2 June, FPKW volunteers repaired the last missing section of track on the 49km line from Rogow to Biala Rawska. Works draisine Wmc-009 , pictured above, became the first rail vehicle to reach the end of the line since autumn 2011. Work begins. New sleepers being laid. Photo FPKW. The final missing link on the route was a length of stolen rail at km 33.7 near Konopnica. As the sleeper fixings had also been stolen along with the rail, this required completely new sleepers. Lifting the first rail into place. Photo FPKW. The repair was only possible thanks to donations from Rawa Mazowiecka district council, PKP PLK, and the National Sugar Company, as well as the many individual donors to FPKW, including those Behind the Water Tower readers who gave money through FPKW’s PayPal donation facility during our campaign to help restore the railway. Thank you to all. Krosniewice’s restored MBxd1-204 railcar, built in 1967. Photo Krosniewicka Kolej Waskotorowa. The railway film festival to be held in Krosniewice from 24 to 26 May promises trains to Krzewie using restored Polish railcar MBxd1-204, pictured above. These will be the first public trains on the railway for several years. This is the first event following the setting up of the new Krosniewicka Kolej Waskotorowa (Krosniewice narrow gauge railway) Facebook page on 25 April 2013. The timetable shows five return trains between Krosniewice and Krzewie, four of them connecting with Koleje Wielkopolskie’s local trains between Poznan and Kutno. The fifth train is an out and back ‘special’ including photo stops. Krzewie Wask is the narrow gauge platform on the south side of Krzewie station, reached by the same subway used to access the standard gauge platforms. Although the film festival is advertised as starting on Friday 24 May, the trains will only run on Saturday 25 and Sunday 26 May. The poster lists the other attractions of the film festival weekend, including the screening of Polish Film Chronicle material made by PKP between 1950 and 1960, the opportunity for visitors to bring and screen their own films, manual draisine rides, and snack and drinks stalls. It is wonderful to see the return of railway activity at Krosniewice, and especially encouraging to see the list of organisations supporting or sponsoring the event, namely Krosniewice town council, the Lodz marshal’s office, PKP SA, the Lodz Society for the Protection of Monuments, the arts and cultural group NEO, and the Krosniewice narrow gauge railway volunteer group SKKW. It is now just over 5 years since the regular scheduled railbuses to Wielka Wies, Dabrowice and Ostrowy, and the profitable freight traffic, ceased on 31 March 2008 when the mayor of Krosniewice terminated SKPL’s operating licence. Since then, there has been little real activity on what was once one of the biggest and most active of PKP’s narrow gauge networks. Instead there has been much political wrangling behind the scenes. Elsewhere, the demand from tourists to travel on Poland’s remaining narrow gauge railways is growing strongly, so fingers crossed that this event will be the start of a new dawn for Krosniewice, and that the railway will continue to receive the support it needs from local politicians. An update on the Krosniewice Kolej Waskotorowa Facebook page says that the planned Krosniewice-Krzewie trains using MBxd1-204 have had to be cancelled for technical reasons. The film festival is going ahead, and there will be the possibility of platelayers trolley rides using either a Wmc diesel trolley or a manual trolley within the station area. Film festival attendees wishing to arrive at Krzewie should telephone 696 197 757 or 784 121 830 for replacement road transport. The event organisers sincerely apologise. 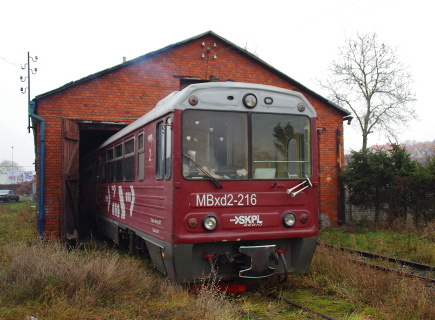 One year to go – railbus MBxd2-216 on shed at Pleszew Miasto on 1 December 2011. Photo Ed Beale. On 7 December 2012, unnoticed and unreported, regular passenger trains on the Pleszew narrow gauge railway ceased, bringing to a close the long era of regular passenger services on the Polish narrow gauge. The end of services was not announced on the SKPL Facebook page (now their only news outlet, since their old website closed down a couple of years ago), and only came to light as the result of a question posted on the 750mm.pl forum. The railway has not closed completely, and it is likely that occasional tourist specials will continue to run on the narrow gauge tracks, as well as regular freight on the standard gauge tracks. The Pleszew railway, being just 4km long and dual-gauge throughout, seemed an unlikely candidate for Poland’s last regular narrow gauge passenger service, but it outlasted Smigiel by 2 years, and Krosniewice by almost 5 years. The service survived with local authority funding, and using the staff employed by SKPL’s profitable freight business but, as we reported in September, when the local authority funding was cut last autumn and a through ticketing arrangement with Przewozy Regionalne fell through, the end of the passenger services was inevitable, and in the event it survived for only two months. The 4km Pleszew Wask to Pleszew Miasto line is the surviving part of the Krotoszyn District Railway, which opened in 1900 and at its maximum extent ran 50km from Krotoszyn, through Dobrzyca and Pleszew, to Broniszewice. The railway was operated by PKP until 9 June 2001, then closed for 5 years until it was reopened under the management of SKPL on 17 September 2006. As well as the station buildings at Pleszew Wask and Pleszew Miasto, and the locomotive sheds and plinthed Px48 steam locomotive at Pleszew Miasto, some remains of the rest of the railway exist, including another plinthed Px48 and train at Krotoszyn, and the station building at Dobrzyca. Carriage fire at Wolsztyn, 25 February 2013. Photo OSP Keblowo. At around 1am on Monday 25 February the fire brigade were called to a fire at Wolsztyn. One of the two carriages used for the regular steam service was almost completely destroyed in the blaze, though the fire brigade managed to prevent it spreading to the second coach. With no spare steam heat-capable stock Koleje Wielkopolskie were forced to cancel today’s steam service. A railbus normally used on the Leszno service was substituted. This unfortunate event has highlighted once again how tenuous the steam hauled service at Wolsztyn is, where the loss of one coach or a single locomotive failure can lead to the suspension of the service, often for a week or more. The steam service may now be suspended for some time until Koleje Wielkopolskie can obtain a suitable replacement coach. A winter journey from Smigiel to Stare Bojanowo in January 2010. Video by bosz112. 12:00 Special train from Smigiel to Stare Bojanowo and back with diesel locomotive Lxd2-241 and snowplough. Numerous photo stops. 14:00 Special train from Smigiel to Zegrowo and back with diesel railbus MBxd2-266. Several photo stops. Anyone wishing to participate is asked to book a place before Monday 28 January by emailing kolejka@smigiel.pl or telephoning 696411584, giving your full name, contact telephone number, and whether you wish to use the optional Stare Bojanowo connecting trains. The cost is 40zl per person, plus an additional 5zl for each of the optional Stare Bojanowo transfers at 11:00 and 15:10. Elsewhere on the Polish narrow gauge, the Bieszczady forest railway is operating regular winter trains for the second year in a row (see Narrow gauge trains in the snow). These depart Majdan station at 12:00 on Fridays and Saturdays during the Polish winter school holidays, running 6km to Dolzyca and returning to Majdan at around 13:15. And a special train is planned on the Znin narrow gauge railway on 30 March, including a connecting standard gauge special train and bus from Poznan. 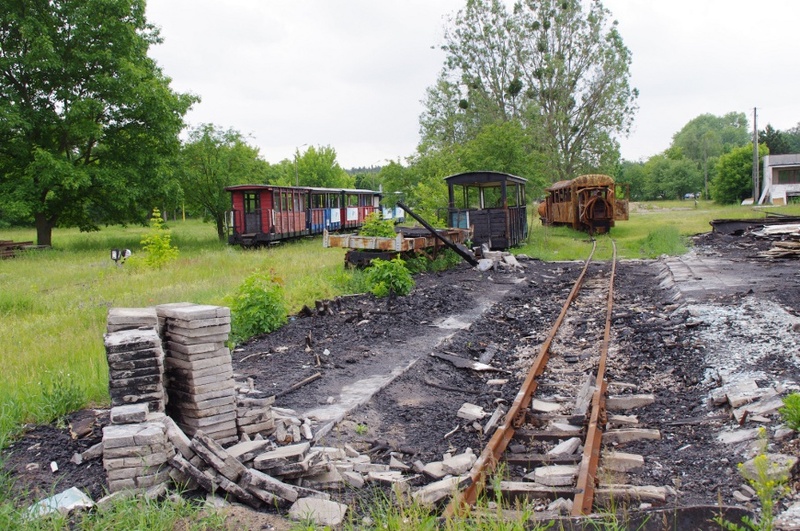 Return to Gluchow – the first train since the track was damaged by thieves almost a year ago. Photo FPKW. On Saturday 17 November the Rogow narrow gauge railway celebrated the 10th anniversary of the first trains in preservation. PKP ceased passenger operations on the Rogow narrow gauge railway on 9 June 2001 and freight operations at the end of September 2001. It took a year for PKP to hand over responsibility for the line to Rawa Mazowiecka district council and for the council to conclude the necessary licence with FPKW, The Polish Narrow Gauge Railways Foundation, with the formalities complete in October 2002. The first public passenger trains under FPKW ran on the All Saints Day public holiday, 1 November 2002. Track repairs on the Rogow narrow gauge railway. Photo FPKW. This year’s event was more than a celebration of the 10th anniversary; it was also a celebration of the reopening of the line beyond Jezow, where in December last year thieves stole 11.5 tonnes of rail bolts and chairs, and in the process damaged 460 sleepers. Behind the Water Tower readers supported the campaign to raise funds for the repair of the line, and the foundation also received support from the Rawa Mazowiecka district council, and donation of materials from PKP PLK. In the end the task was too large to be completed by volunteer labour so contractors were employed to repair the line between Jezow and Gluchow, while volunteers repaired other smaller areas of damage that had occurred beyond Gluchow during the period that the line was closed. Tenth anniversary special train on the bridge over the river Rawce. Photo FPKW. The special train on 17 November consisted of diesel locomotive Lyd1-215, van, traditional Polish 1Aw passenger coach and brake/postal van. Thanks to the efforts of the volunteers the train was able to reach not only Gluchow, but all the way to Zamkowa Wola, the first station beyond Rawa Mazowiecka, 32km from Rogow. Congratulations to all at FPKW and Rogow for this fantastic achievement. However, the work is not yet complete – there is more damage to repair beyond Zamkowa Wola. FPKW have again appealed for help in raising the money to restore the final 17km of the railway between Zamkowa Wola and Biala Rawska. Any donations would be gratefully received. Behind the Water Tower readers who would like to make a donation can do so without incurring bank transfer fees by using the PayPal donation button on the FPKW homepage. With thanks to Ed Beale for sourcing the photographs. Brigadelok at Irena sugar factory in Lyszkowice. As followers of BTWT will be aware, the First World War saw construction of many narrow gauge ‘field railways’ in what is now Poland, a number of which subsequently found use as common carrier railways under PKP. While Austria and Russia built such lines, the vast majority were the German Heeresfeldbahnen (miltary field railways). Of the lines (or networks) taken over by PKP, the Kujawy network is probably the most widely known today and, following eventual conversion to 750mm gauge, was the last of the classic former Feldbahnen to survive in operation; although the Zbiersk line was a First World War creation, it was always 750mm gauge and was built for economic rather than purely military purposes. the Zwierzyniec – Bilgoraj line probably takes the prize for the number of different gauges, being originally built by the Russians on 750mm gauge, later a 600mm gauge line built during the war, converted to 750mm gauge by PKP in the 1960s and closed in the 1970s to be replaced by a standard gauge line that was later joined by a Russian gauge railway! There were various other lines in present-day Poland which saw short-lived civilian service and also, largely forgotten today, PKP operated significant former Heeresfeldbahnen in those regions lost to the Soviet Union in the Second World War: the 90+km Dukszty-Druja line, the 66km Nowojelnia – Nowogrodek – Lubcz line, the Baranowicze network and the Iwacewicze – Janow – Kamien system (on which PKP still operated passenger services over 214 route kilometres in 1939) to name only a few. Besides these significant lengths of railway for which a post-war use was found, there were as many, probably many more, which were redundant. As these lines were dismantled; the track materials were sold off. Furthermore, the German authorities had ordered around 2,500 of their standard 0-8-0T Brigadelokomotiven (commonly known in Britain as ‘Feldbahn’ locomotives), many of which were stored or still under construction when the war ended – locomotives were still being delivered to military stores depots well into 1919. These locomotives were also soon on the market. Transhipment from a Wisla barge on the Borowiczki sugar beet railway, 1941. Many forestry and industrial concerns in Poland took advantage of this ready availability of 600mm gauge railway equipment to build their own railways in place of horse and cart transport of raw materials and/or finished products. The advantages of narrow gauge railways had been recognised by sugar factories in the German-controlled part of Kujawy from the 1880s, and those in the Russian-controlled areas had begun to follow suit before the war. The 1920s saw an explosion in the construction of sugar factory railways. Some, such as Ostrowite, chose 750mm gauge but for most the availability of Brigadeloks and other equipment led to 600mm gauge being selected. Amongst the factories that developed 600mm gauge railways at this time were Klemensow, Mala Wies, Izabelin, Borowiczki, Cielce, Guzow, Dobrzelin, Chelmica, Mlynow, Irena and Lesmierz. German 1944 1:2500 map based upon pre-war Polish WIG cartography showing the end of the Lesmierz line near Unjejow, in the yard of a private estate in Dominikowice. Did the Lesmierz line link up with an existing estate railway? Lesmierz sugar factory’s railway was built between 1920 and 1928. The first section built was a link to Sierpow station on PKP’s 600mm gauge Krosniewice – Ozorkow – Strykow line, itself built as a Heeresfeldbahn. Note that the standard gauge Kutno – Zgierz line through Sierpow did not open until 1924. From Sierpow the railway was continued westward. WIG maps show the railway’s most westerly terminus was Dominikowice, south of Uniejow, while there was a lengthy branch running north from near Pelczyska to Swinice and Kozanki. In 1926, before completion of the network, the Lesmierz sugar factory railway was recorded as having 70km of track, 8 steam locomotives, 160 freight wagons and 2 passenger coaches. Presumably the link to the PKP line served to deliver coal and limestone to the factory and take away finished sugar, while the lines further west served to bring in sugar beet and take out beet pulp. Further to the east, Irena sugar factory in Lyszkowice, south of Lowicz, built a 600mm gauge railway in 1920-1 to Domaniewice station on the Lowicz – Lodz standard gauge line, presumably serving only to bring in coal and limestone and take away the finished sugar. The railway of Mlynow sugar factory at Piatek, south east of Kutno, probably also dates from the 1920s. The main line of this system ran to Jackowice station on the Lowicz – Kutno standard gauge line, but the fact that there were branches through Janowice to Balkow and through Przezwiska to Borow as well as other short branches (all shown on WIG maps) suggests that the railway transported beet and pulp as well as coal etc. To the north of these lines Dobrzelin sugar factory also developed a quite extensive 600mm gauge railway between the wars. German 1940 1:2500 map (reprinted 1944) based upon pre-war Polish WIG cartography showing the line to the sugar beet factory at Lesmierz, but not its WWII extension eastwards to Pokrzywnica. And then came German occupation. In the First World War the Germans had created links between various sugar factory railways and they did so again in the Second World War. In the north of Kujawy they converted the 900mm gauge Pakosc/Tuczno/Wierzchoslawice railway to 750mm gauge and linked it to the Matwy, Kruszica and Dobre systems of that gauge, and created various other links between those railways. In the south east of this sprawling, still partly 600mm gauge network, they created a number of links. From Lesmierz a line was built east to join the Mlynow system at Pokrzywnica. From Domaniewice the Irena sugar factory’s railway was extended north west to join the Mlynow system at Walewice. From Jackowice the Mlynow system was extended to Czerniew, where a connection was probably created with the Dobrzelin factory’s system. Soon after the war these lines started to be divided up and partially dismantled. Irena sugar factory closed in 1947 and although its railway may have been taken over by Dobrzelin, it was probably soon dismantled. Most of the rest of the Mlynow system was taken over by Lesmierz. In 1948 work started on converting PKP’s Krosniewice – Ozorkow line to 750mm, being completed in 1951. Consequently, in 1952 the 3km section of the Lesmierz system linking the factory to PKP’s Sierpow station became mixed 600/750mm gauge; henceforth the beet and pulp were carried in 600mm gauge wagons and coal etc. in 750mm gauge wagons. Two 750mm gauge locomotives were acquired by the factory to serve this short but vital link. Lesmierz sugar factory in 1927. The Lesmierz 600mm gauge network gradually shrunk. By 1950 it had already reduced from around 120km to 90km and by 1970 had declined to 60km. In the latter year, however, there were 14 steam locomotives, 240 wagons, 2 coaches and 3 diesel locomotives. The end of narrow gauge operations appears to have come in the 1980s or early 1990s. The last year in which PKP supplied beet to the factory in narrow gauge wagons was 1986, when some 15,000 tonnes were brought in and almost 13,000 tonnes of pulp taken away. By way of comparison, ten years later the Tuczno system carried 140,000t of beet and 36,000 tonnes of pulp. Ex Lesmierz Fablok 1982/1949 0-6-0T Las, together with a sister engine, ex Plocicznow 3816/1958 Chrzanow have been repatriated to Poland and will be exhibited at the Krosnice Park Railway. Some splendid historic n.g. engine photographs by the late Tomasz Wach – including 8 photos of engines on the Lesmierz sugar beet line – used to be hosted by Tomislaw Czarnecki on his Wciaz pod Para website. Sadly the link to Tomasz Wach’s gallery no longer (as on 12.11.12) appears to work. Tourist train at Smigiel on 3 May 2012. Photo Pawel Jakuboszczak. 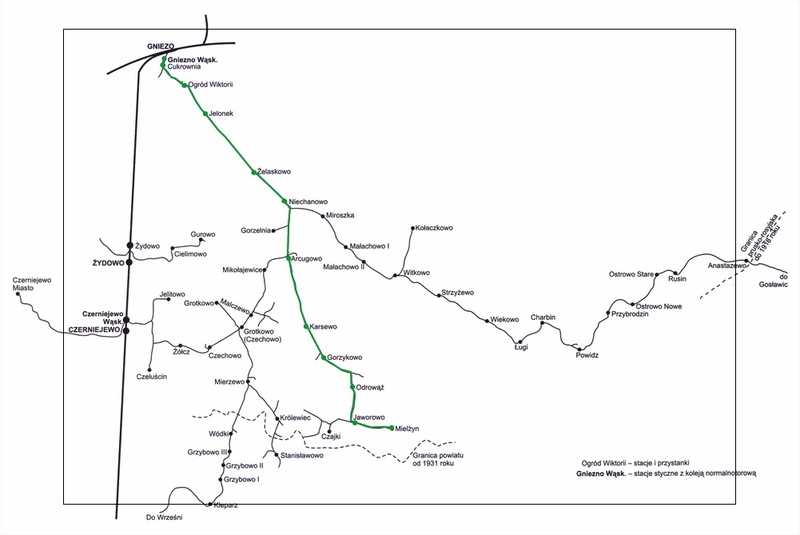 The operating length of the Smigiel narrow gauge railway has been extended by 3km to Nowa Wies. The first public train will run over the reopened section this Sunday 11 November at 12:00. Together with the 5km from Stare Bojanowo to Smigiel this brings the total length in use to 8km of the 24km long line. There are also plans to reopen the 4km section between Nowa Wies and Bielawy. 10:00 Smigiel – Stare Bojanowo – Smigiel with photo stops. 12:00 Smigiel – Nowa Wies – Smigiel with photo stops. 13:00 Smigiel – Stare Bojanowo – Smigiel (no photo stops). 14:00 Smigiel – Nowa Wies – Smigiel (no photo stops). Diesel locomotive Lxd2-241 will haul the Stare Bojanowo trains, diesel railcar MBxd2-226 the Nowa Wies trains. Fares are 10zl for the trains with photo stops and 5zl for those without. Details of Sunday’s event were published on the website www.kolejka.smigiel.pl on Wednesday 7 November, unfortunately giving prospective visitors just four days notice! The first year of the tourist operation has been a mixed experience for the new local council operators. While some events proved very popular, especially the early season school specials which carried around 600 children, and the public trains on 3 May which carried a total of 300 passengers, numbers dropped to around 100 for the ‘Smigiel days’ event on 26 May, and several planned trains were cancelled, on 23 June, 12 and 15-19 August. Rail enthusiasts were also dismayed by the sale for scrap of most of the transporter wagons previously used to carry standard gauge freight wagons on the narrow gauge line, the abandonment of the lines running into the PKP passenger station and freight interchange, as well as by the sale of two of the line’s Lxd2 locomotives. Pleszew Miasto station, December 2011. Photo Ed Beale. 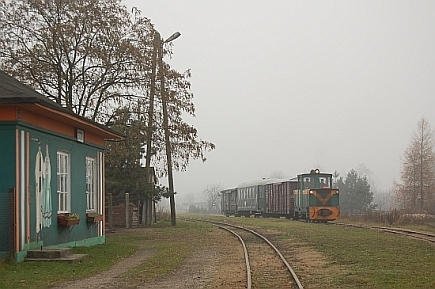 Passenger services on the Pleszew Railway, Poland’s last regular narrow gauge passenger service, are facing serious problems. The service has been in steep decline since 2010 when there were 6 return trains a day. In December 2010 the service was reduced to 5 trains a day, then to 3 return trains in March 2011, then to 2 return trains in September 2011. By that time it had been reduced to a basic schools service, nominally still providing a link between the town and the standard gauge station but really only used by teenagers going to school in Pleszew. Trains do not run during school holidays but usually resume in early September. However, this year things have taken an even more serious turn. The railway has not resumed for the start of the school year, apparently due to road repairs being carried out on ulica Lipowa, which crosses the narrow gauge line in Pleszew, and when trains do resume on Monday 8 October the afternoon train pair will be suspended due to lack of financial support from the local government, leaving only one train a day in the morning, from Pleszew Miasto at 06:20, returning from Kowalew (Pleszew Wask) at 07:22. When BTWT asked SKPL for comment, they sent us a copy of a letter from Przewozy Regionalne turning down a suggestion for a joint ticketing arrangement from Pleszew Miasto to destinations on the main line network. Apparently the scheme, which would have boosted passenger carryings and was enthusiastically received by PR HQ in Warsaw, was just too much trouble for local PR management to implement. So, for the moment, teenagers may still go to school on the train, but must go home by bus. Following the much documented end to the regular passenger services at Krosniewice and Smigiel, it seems that the end may well be nigh for the last regular narrow gauge passenger service in Poland. Borsig approaching Maltanka station, 4 May 2012. 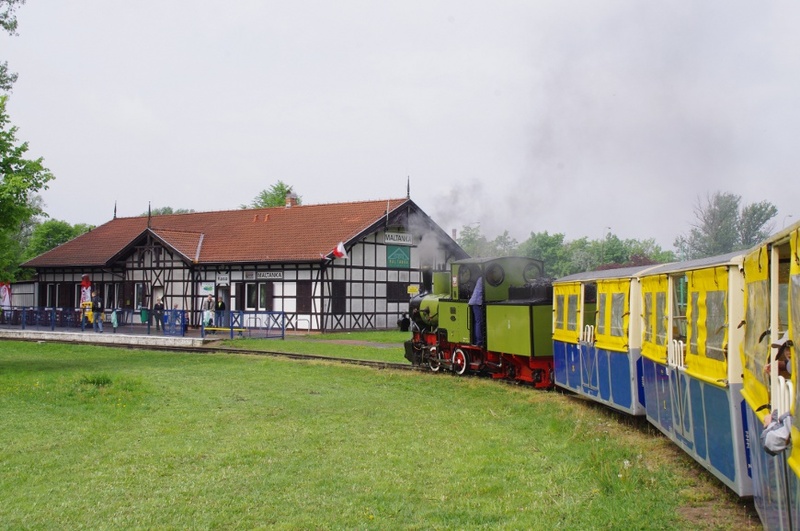 On 21 July this year the Maltanka park railway in Poznan celebrated its 40th birthday. 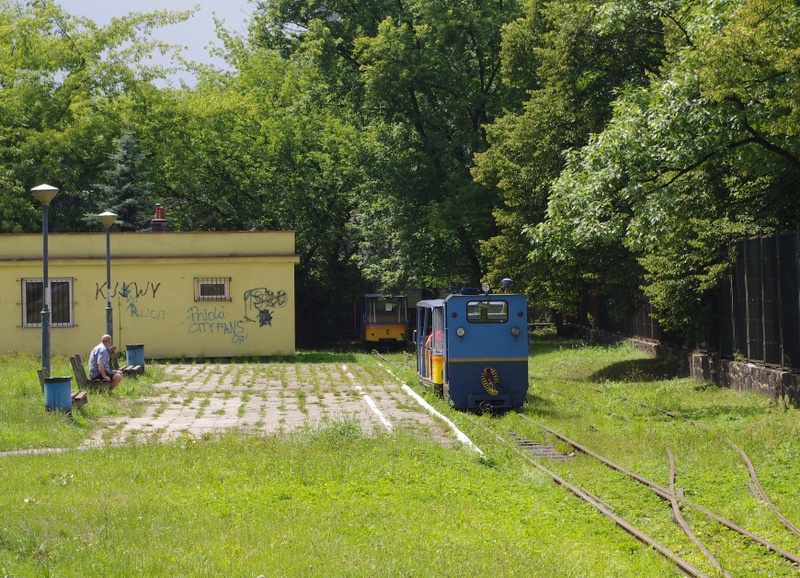 It was opened on 21 July 1972 as the successor to the first park railway in Poznan, the Scouts Children’s Railway (Harcerska Kolejka Dziecieca). It is 600mm gauge and runs the full length of Lake Malta, from Maltanka station at the western end of the lake near the Rondo Srodka tram stop, to Zwierzyniec station beside Poznan zoo, a total of 4km. Ptys station near the middle of the line serves the new Termy Maltanskie baths. On certain dates of the year the line’s Borsig 0-4-0 steam locomotive is used on one of the two trains. All other trains are hauled by one of the three small diesels, all built by ZNTK Poznan to a standard design used on many industrial narrow gauge railways around Poland. These are WLs40-100 built in 1952, Wls50-1225 built in 1961, and WLs50-1563 built in 1964. The weekday timetable sees hourly departures from either end of the line, on the hour from Maltanka, and on the half-hour from Zwierzyniec, from 10:00 to 18:30, while at weekends and in the summer holidays there are half-hourly departures in each direction, with the two trains passing at Balbinka station. The line is very popular, especially on sunny days when the plastic coach sides are rolled up. The Borsig loco, Bn2t-2, was built in 1925 and worked at a chemical plant, Zaklady Azotowe in Chorzow, until 1977 when it was plinthed in a park beside the works. It was brought to Poznan in 1990 by the Railway Modellers Club of Poznan and restored to operating condition in 1999. Steam-hauled trains run every other weekend during the summer. The remaining steam dates this year are 25 and 26 August. A second steam locomotive, the much larger 0-8-0 tank locomotive Tx26-423, is plinthed at Maltanka station, but has never worked here. It was built in Chrzanow in 1926 and worked on the Jedrzejow system while that was 600mm gauge, and then on the Jarocin District Railway until withdrawal in 1978. Another item of historic rolling stock which used to run on the Maltanka railway was single-ended railbus MBxc1-41 built in 1934. It originally worked on the Bydgoszcz District Railway, then at Witaszyce from 1953 to 1991, before coming to Maltanka where it worked off-peak trains between 1994 and 2002. Unfortunately it is now out of service and is currently stored at Forteczna tram works in Poznan Staroleka. From photographs it appears that sadly it is being stored in the open and its condition is deteriorating. It was a highlight of my first visit to Maltanka in 2001 and a rare survivor of the railbuses which were once common on Poland’s 600mm narrow gauge lines, so I hope it returns to traffic. Myslecinek remains, 7 June 2012. Photo Ed Beale. Elsewhere in Poland, park railways are suffering very mixed fortunes. The fire that destroyed virtually all the rolling stock on the Myslecinek park railway in Bydgoszcz was reported in Behind the Water Tower on 25 September 2011. After the fire the majority shareholder in the line, PKP Cargo, was not sufficiently interested in the railway to invest several hundred thousand zloty to restore it, and Bydgoszcz city council did not have the money to restore it either, so the railway was placed into administration seeking a buyer. When I visited in June I found the stock abandoned in the open next to the charred footprint of the old shed. The four coaches which were not affected by the fire had been vandalised, and the rails lay abandoned and rusting. Chorzow WPKiW park railway, 8 July 2011. The future of the Chorzow WPKiW park railway is also now uncertain after the park authorities terminated the operating contract of SGKW, the society based at the Bytom narrow gauge railway, earlier this year. This is the oldest surviving park railway in Poland, originally built as a metre gauge line in 1957 and converted to the unusual gauge of 900mm in 1966. When I visited in July 2011 I found the railway to be in a fairly run-down state. Wesole Miasteczko station at the southern end of the line close to the tram stop was covered in graffiti and had no timetable on display, the track was overgrown with weeds, and trains were running with just a single coach and far from full. Px48-1907 on test at Krosnice. Video by Jan Krosnicki. On a brighter note though, the new park railway at Krosnice, reported in Behind the Water Tower on 11 October 2011, is nearing completion. A total of 4.7 million zloty have been spent on the construction of the railway, which is expected to be complete by October. In a surprise move, the Krosnice railway recently purchased steam locomotive Px48-1907, which previously ran at Nowy Dwor Gdanski but was privately owned. While a boon to the new park railway, this sadly leaves the Nowy Dwor Gdanski railway without a steam locomotive, a further blow to that railway following the recent track theft that closed the Tuja extension.